Toastmasters club is the best way to improve your communication skills. Loose your fears of public speaking and learn skills that help you be more successful in whatever path you've chosen in life. The mission of Toastmasters club is to provide a mutually supportive and positive learning environment in which every individual member has the opportunity to develop oral communication and leadership skills, which in turn foster self confidence and personal growth. Toastmasters International is a non-profit organization governed by a Board of Directors elected by the membership. The first Toastmasters club was established on October 22, 1924, in Santa Ana, California, by Dr. Ralph C. Smedley, who conceived and developed the idea of helping others to speak more effectively. More clubs were formed, and Toastmasters International was incorporated under California law on December 19, 1932. How to make your toastmasters club more effective and more useful? 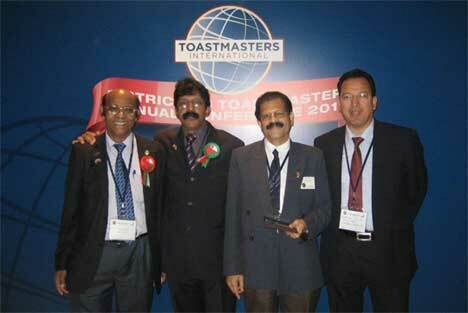 Toastmasters: Why Attend Club-Officer Training? "A Compilation of Toastmaster's Guide for Current and Future Leaders"
Each new Toastmaster receives a New Member Kit. The kit features a copy of the basic Communication and Leadership manual, general orientation materials and information regarding skill improvement in areas such as speech evaluation and the use of gestures. During the meeting's Table Topics session, members learn to think on their feet by delivering short impromptu speeches, lasting one to two minutes. Joining a Toastmasters club is easy. With more than 8,000 clubs around the world, there is sure to be one near you. Follow the Find a Club link to search World wide index of clubs. Contact your nearest club and attend one meeting. The more than 170,000 members are from a variety of occupations and backgrounds. They include doctors, Engineers, auto mechanics, executives, teachers, homemakers, artists, college students, supervisors, attorneys, salespersons, and more. Toastmasters is only for individuals 18 years or older.